Until recently one of the thinnest smartphones in the world, now only second-best actually, the Oppo R5 made it through our review routine and our findings are live at our homepage. The impressively thin Oppo R5 packs a 5.2” AMOLED screen of 1080p resolution and runs on the Snapdragon 615 chipset with an octa-core Cortex-A53 processor. This great hardware package is powered by a 2,000 mAh battery – a relatively small capacity for such a demanding smartphone. 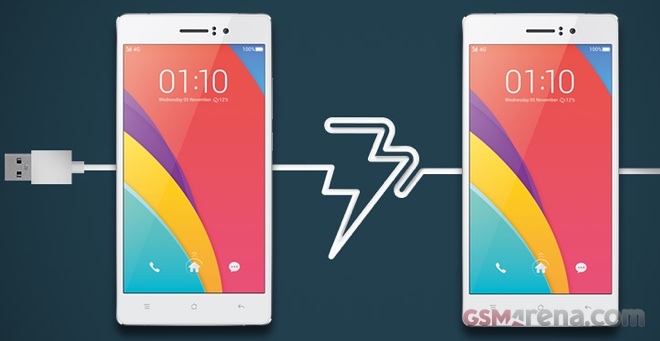 Let’s find out how the Oppo R5 did at our battery torture test, shall we? 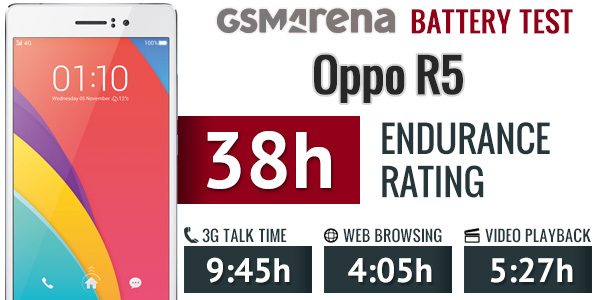 Our first routine tests the Oppo R5 3G call endurance. The handset did rather poorly packing enough power to last few minutes short of 10 hours before its battery went flat. Next we measure the web browsing endurance of the R5’s default web browser – Google Chrome. We ran our dedicated web script, which emulates typical browser usage, and the Oppo R5 did really poor lasting just 4 hours before it wend dead. This score place it at close to the bottom of our all-time chart. Finally, such a great screen will be used for enjoying some great movies for sure. Our looped video playback test shows the Oppo R5 battery is enough to last you five and half hours before it reaches the critical 10%. This is enough for at least three movies, but really unimpressive result compared to other phones we’ve tested so far. Oppo R5, even though it posted some poor scores, provides an above average standby endurance, which raises its overall endurance a bit. Still it isn’t enough to move the Oppo R5 from the bottom of our battery life chart. The rating of 38 hours means Oppo R5 will last about a day and a half if you do an hour each of calls, video playback and web browsing each day. Disappointing indeed.